Start your visit of this old Portuguese fort from the harbour. This is a charming old fortified fishing port on the Atlantic coast that the Portuguese named Mogador. Founded and occupied by the Portuguese in the 16th century to take advantage of the Trans- Saharan trade routes, the city was rebuilt in 1760 and named Essaouira before it attracted a great number of foreigners and a big part of the Jewish community in Morocco. The city became Morocco’s international port and trading centre. See the impressive town fortifications consisting of an amazing mixture of Portuguese and Moroccan military architecture. Explore, in your guided tour, the spice souks, the jewellery market, different artisan markets and the carpentry workshops devoted to cedar and thuya cabinet making. Essaouira has attracted artists and musicians from different parts of the world and you will see some of their works in the different art galleries of the city. You will end your walking tour of Essaouira in the harbour with its stalls of freshly caught barbecued fish and you may want to end your tour here and stay for lunch. 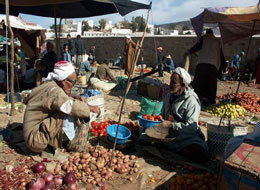 The day is dedicated to the discovery of the neighborhood and the country side of Essaouira and Berber villages. Focused on the rural aspect of the tourism with more equity and seeking for interactivity with the local population to understand the secular customs that are deeply anchored in the area. We will head the weekly market of the day, discover the local goods, the traders and the colourful tents with all kind of supplies that one could need. We will stop at different villages, Meskala, Bizdad and Imin Ntli, and then on to the Argan Oil cooperative for the full presentation of the product and its elaboration. Lunch at the cooperative. 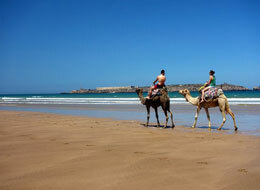 In the afternoon, we will drive toward Smimou and enjoy a short stop in the wild beach of Sidi Kaouki. Return to the hotel. Property of Melia family from France since 1994, these vineyards are situated in the outskirts of Essaouira in the tribal country of Chiadma. After your departure you will stop at the belvedere of Essaouira for a marvellous panoramic view of the city and its two islands. Continue inland across the thuya and argan forest and stop at one of the argan oil women’s cooperatives, this oil is unique to the south west of Morocco and has many virtues, this is why it is now used in cosmetics all over the world. When you arrive in the property of Val d’Argan, you will be taken for a visit to the vineyards and the winery before you are invited for some wine tasting. Val d’Argan wines are produced here in red, rosé or white and exported to different parts of Morocco and abroad. Lunch in the property of Val d’Argan before you return to Essaouira. Your adventure will start from a ranch in the region of Essaouira where you will discover the local breed, “barbe”, known for its endurance, which the famous local Berber horse riders have always owned and used in their wars and horse shows, being the first ever breed we’ve had in Morocco and the “barbe-arabe” mixed with the Arabian that came to us from Egypt and famed for its speed. 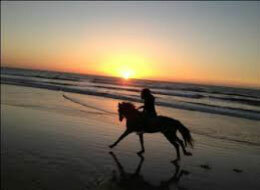 Leave the ranch and wander in an equestrian escape across the open spaces in liberty to explore this endless world of forests, sand dunes and the unspoiled atlantic coast. This is a unique experience to discover the region of Essaouira and exercise a motor sport in a very enjoyable expedition on quad motor bikes led by our local staff who have a deep knowledge of the local terrain. 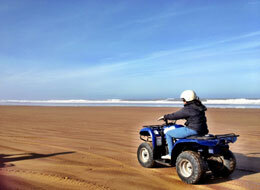 Our programme offers you the chance to discover quad-biking in harmony with nature. Each excursion is tailor-made for your physical aptitude and level and our experienced guides will help you discover the beautiful area surrounding Essaouira, its rivers, wild beaches and immense sand dunes. Try different terrains and difficult paths and enjoy the feeling in complete safety with your family, friends or alone. 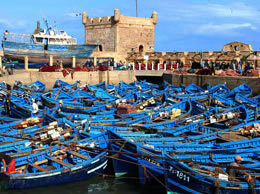 A very amusing family oriented excursion to discover the immediate neighborhood area of Essaouira. You will learn how to ride your camel and go for an easy loop out of the beaten paths. 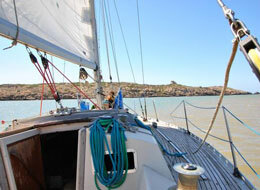 We will take the time to observe the fauna and the flora along the Atlantic coast, meet shepherds and local fishermen. This is a very slow and peaceful excursion in the company of these docile animals and the good supervision and care of our local guide who will help you discover this part of his home country.